Who doesn’t like free stuff? Up this week: Bioware is offering a sample of their new MMO, there's a nifty new mod based on Valve's source engine, and a bit of abject terror. All for no money! If you haven’t taken a crack at Bioware’s new massively multiplayer role playing game, they’re offering a free Weekend Pass to give you a taste. 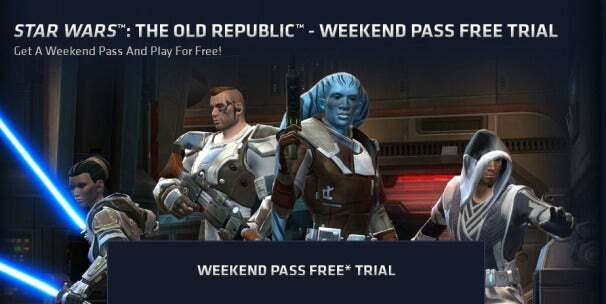 The Old Republic features gameplay that’s, ahem, evocative of Blizzard’s World of Warcraft. But it really amps up the storytelling, with the voice work and moral decisions Bioware has become known for from games like Mass Effect and Dragon Age. The game may not have the polish of Blizzard’s magnum opus, but it’s certainly got more than enough content to keep you busy for a weekend. Maybe it’ll be enough to get you to subscribe? Take the plot of the movie Cube, the look and feel of hit first person shooter/puzzler Portal, and pack it all into a mod using Valve’s Source engine, and you’ll get CUBE. It’s a puzzle game featuring hours of gameplay and multiple endings. I’ve only managed to scratch the surface of so far, but despite some bugs, it’s definitely worth checking out. Maybe you don’t really like puzzles. Maybe you’d rather spend the weekend scared out of your mind. The Stairwell is based off of a creepy little Internet short story called SCP-087. about a seemingly endless staircase that’s home to some kind of malevolent force. The Stairwell has you locked in the stairwell with nowhere to go but down. Check that one out at your own peril. If you’re intent on getting your scare on, poke around the SCP site for a few hours. Yikes.